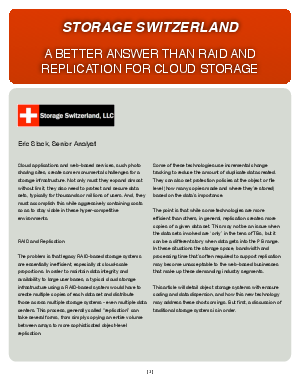 The scale of storage expansion required by the cloud may be rendering traditional RAID and replication storage infrastructures obsolete. The latency introduced with large RAID rebuilds is unacceptable and the capacity, processing and bandwidth overhead these legacy systems need is just too costly. For use cases such as Software as a Service (SaaS), social media other large, web-based applications, object storage with erasure coding and data dispersion can be the enabling technologies that eliminate RAID’s inefficiency and provides the economics required to make these business models feasible.